How much can I make as a contractor? There are various reasons for this. The contractor’s role and therefore their contractor rates will be determined by the sector as well as skill set and experience. There’s also a regional influence too. For example, contractors working in London will generally earn more than contractors elsewhere in the UK, regardless of the sector they work in. However, it is crucial that contractors pay attention to all these factors to quote a fair rate for the work they perform, as failing to do so could reduce their chance of winning a contract. There’s no doubt that a contractor’s need to maximise their income is the key reason to quote a good rate for the market they work in, taking into account their skill set, experience and qualifications. So, how does a contractor compare their rates with employee salaries? One way is to check job adverts for permanent roles, as these usually display a salary along with any benefits, such as pension, insurance and paid holidays. A contractor can use these as a benchmark to compare opportunities with a similar role in an employed position. For those who are new to contracting it is important to appreciate that contract work generally pays more than a permanent job will, but there will also be more personal expenses involved. It’s for this reason a contractor should use what they earned as an employee only as an estimated starting point for their rates as a contractor. They will also need to take into account the value of benefits that often come hand in hand with permanent work; for example, pension contributions, paid annual leave or even subsidised gym memberships. This will bring you to a total package figure which you can simply divide into a weekly, daily or hourly rate to determine your minimum contract starting rate. Don’t forget, as a contractor you will have additional expenses such as having an accountant, training or membership subscriptions and paying insurance. 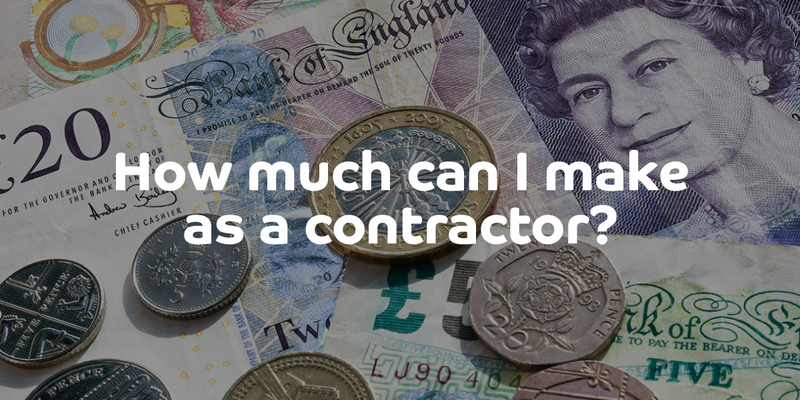 In the previous section we discussed how a contractor can determine what their starting contract rate should be, but there are a number of considerations to be mindful of. You will need to consider the impact of IR35 on your take home pay, and how you may need to adjust your rate if you are inside IR35. For example, you may decide that to meet your standard of living you want to earn £50,000 a year as a total package. However if you fall outside IR35 you would need to charge around £28 per hour to reach this annual figure. Whereas, if you fall inside IR35 you face additional taxes and would therefore need to charge a higher rate of around £39 per hour to reach the same take home pay – that’s a big difference to consider. If you are confused about how IR35 affects you, contact one of our friendly team for more information. There are regular surveys of contractor rates across a number of sectors which can provide key information for those thinking of becoming a contractor. For example, the ‘Technojobs’ website offers data that reveals what contractors should consider for salary benchmarking in the IT sector. Their research considers a range of factors including qualifications, experience and location. For instance, an employed software developer in the UK earns £40,000 on average. In London it’s around £47,000. However, a contractor working as a software developer can earn £350 per day – or £91,000 a year – and in London that rate increases to £425 or £110,500 (although these figures reflect the contractor not taking holidays). It’s not just in IT that contractors can earn excellent salaries. There are rich pickings in the oil and gas industry too. The ‘Totaljobs’ website has calculated that the average employed salary for oil and gas jobs is £37,500, while a survey of contractor rates by ‘Glassdoor’ reveals that a contract manager in the same industry can earn between £72,000 and £78,000, and a sub-contractor can earn between £38 and £52 per hour. It’s possible to access similar data across a wider range of markets. One good source is the 2018 UK Salary and Recruiting Trends report compiled by recruitment firm Hays. Don’t forget, you can also ask other contractors what they charge to help you set your contractor rates. Understanding what rates you should charge as a contractor will become vital if you decide to apply for a job via an agency. When they contact you to arrange an interview one of the first questions they always ask is what your going rate is. As such, you can also determine the current market rate for contractors in your sector by contacting agencies and asking what a good rate for your skills would be. As part of the process of determining what you are worth as a contractor, you should be wary about committing to a first contract that runs for an extended period, without an opportunity to review the rates and conditions of your contract. This is because you may have under-priced yourself initially, due to lack of experience and may later regret not charging enough. In addition, your first contract will also help you to understand what you are worth in the contracting marketplace. Finally, all contractors – whether new or experienced – should be aware that if they fulfil a contract that would demand a higher rate of pay than previously agreed, it is not unreasonable to ask for more money to accommodate the change in circumstances. Look out for future ContractingWISE articles on developing negotiating skills and perfecting your pitch for winning a higher-paying contract.